Luke Willson is one of my all-time favorite people in sports; dude's so interesting. On the football field, he was good in his role but nothing that the Seahawks are "missing" but our TE game has definitely taken a step back due to injuries and Nick Vannett's lack of progress. I sorely miss Golden Tate. As an Arm-Chair QB, I would have never signed Percy Harvin based on the fact that I thought Golden Tate was a better fit for our team. The thing that I loved most about Tate was his elusiveness and his run-blocking. He's only played against Seattle twice (once in the regular season and in the playoffs); no more than 3 catches in any game and about 40 yards. 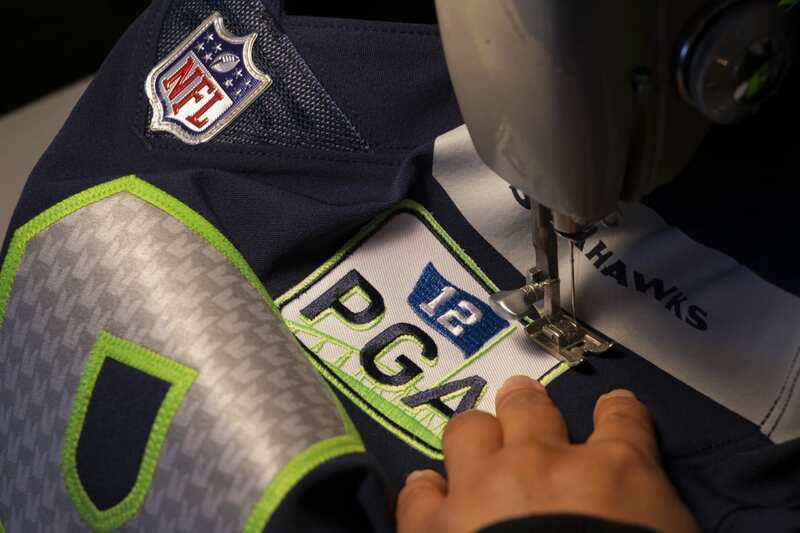 Seahawks will be wearing "12 PGA" patches on their jerseys. Beginning with Sunday’s game in Detroit, the Seahawks will wear patches on their jerseys to honor team owner Paul G. Allen, who died last week from complications of non-Hodgkin’s lymphoma. The patch, which will be worn for the remainder of the 2018 season, features Allen’s initials and a 12 flag, with the CenturyLink Field arches in the background. In addition to patches, the Seahawks plan to spend the rest of the season honoring Allen with their play on the field. Pete is going to win his way, control the ball with an aggressive running game, play sound defense and don't turn the ball over. Russell goes over over 225 yards for only the 3rd time this year. Russell has his first perfect QB-Rating game; 14/17 248 yards 3 TDs and 0 Turners. The running game looks so dominant right now. P Michael Dickson and the Special Teams have the biggest balls. I still miss WR Golden Tate based on how elusive he is but I would not want to be him with MLB Bobby Wagner giving him the business on every crossing play across the middle. This is the turning point. This could be the point in our season where we saw things really change for the better. a) Chris Carson runs HARD. Like, HARD HARD. Lacks the raw ability of Lynch, but man is he a hard worker. He gives up on no run. b) You have my permission to start considering David Moore as your FLEX. c) I kind of smiled to myself when @sammyc521 was talking about Wilson having only 20 attempts last week. I mean, I love the running game as well but THOSE days are in the past even for this Seahawks team. Jokes on me. 17 attempts.. 3 TDS. Wow. d) In my ongoing campaign against the Peyton Manning style of roster building I loudly said Stafford should never have been given an extension. As a franchise QB he is a mirage (but often a bargain in Fantasy!). Yesterday didnt change my opinion at all. Hes a B level QB and will occsaionally get you to the playoffs but he will never win a Super Bowl. e) Michael Dickson.. I mean, I dont think he even knew what he was doing on a deeper level when he ran the ball out of the end zone, but every once in a while ignorance truly is bliss. I expect more interesting moments from The Thunder From Down Under and Im looking forward to them. f) Doug Baldwin aint right. The other day he gave an interview where he sort of bemoaned not being able to do everything he either once could do or should be able to do now. Not getting the two feet down I think is a sign of this.. its all he can do to get the basics done and I dont think hes healthy enough to get the details right and so we are seeing him come up short on 3rd downs or not being able to toe tap. Hes not old so maybe next season he comes back right. g) The Line. Yeah. You saw it. Man.. the Line. Fant being an extra tackle, Pocic isnt bad..suddenly we have 7 legit offensive linemen. h) Dion Jordan -- 4 pressures. Didnt quite get home, but he actually was productive again , coming off extra rest in the bye. I will take that! i) Prosise dressed I heard. Got 2 days to get a 5th for him. j) Stafford is a prolific passer.. but against our young secretary really did very little. One hiccup when T2 let Jones get behind him, but man.. this young defense.. so legit. k) So, looking at the evidence on balance.. I kind of think there really is some sort of bad blood between Wagner and Tate. Great read @Veda-the-Moor ! I agree on all points. Especially when it comes to letter "j". Stafford vs. our young "secretary" was fun to watch. Just don't tell my wife.